There's nothing a Geek enjoys more than a fashion item created with dual intentions, like a multi-convertible garment, or a necklace that doubles as a USB drive. 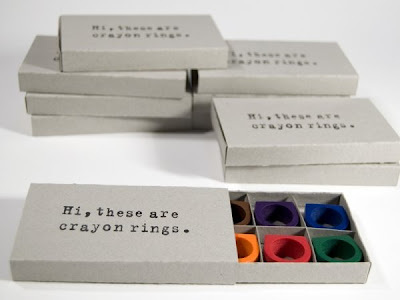 Or... a ring that you can use as a crayon! 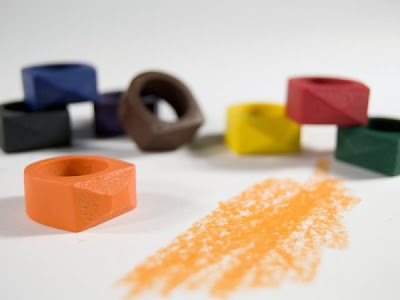 These rings, designed by Timothy Liles, fulfill the chunky, stackable jewellery trend that's going on, and for all those times you find yourself taking a phone message without a writing instrument, you have a good emergency tool at your disposal. Or you know, just get them cos they're fun, and you want to bring out your inner child or have a convenient tool for giving out your phone number on bar napkins because you're too cool to pick up guys who have cell phonebooks. They come in a set of eight, and are available from Future Perfect. I wish I could tell you if they ship to Hong Kong, which I'd normally check on your behalf, except that there's a mistake on their FAQ page and they forgot to type in the answer to "Do you ship internationally?" -- I even checked their source code, so don't say I didn't try! Images courtesy of Timothy Liles' site.